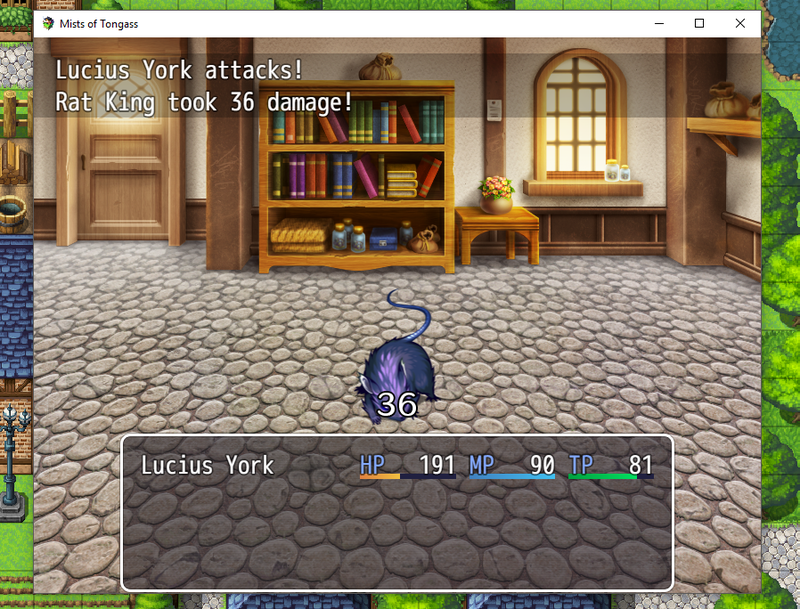 In Part V of our exploration of RPG Maker MV, we created a few enemies and enemy troops for our hero, Lucius York, to fight in his quest to raise 1,000 gold pieces to spring his grandpa from debtor’s prison. Today we’ll be building our first task, using the enemies and enemy troops we previously created. First, we’ll need to make a small change to an event we built in Part IV. Remember Lucius was instructed to visit the jail where his grandpa is kept in order to find out how to release him. After speaking with the Constable, Lucius learned he needs to pay his grandpa’s debt of 1,000 gold pieces. But where to find that much gold? When Lucius exits the jail after speaking with the Constable, I want a new villager to appear to propose a quest. This requires setting up a switch. Remember, a switch is like a trigger that activates when certain conditions have been met, in this case, speaking with the Constable. 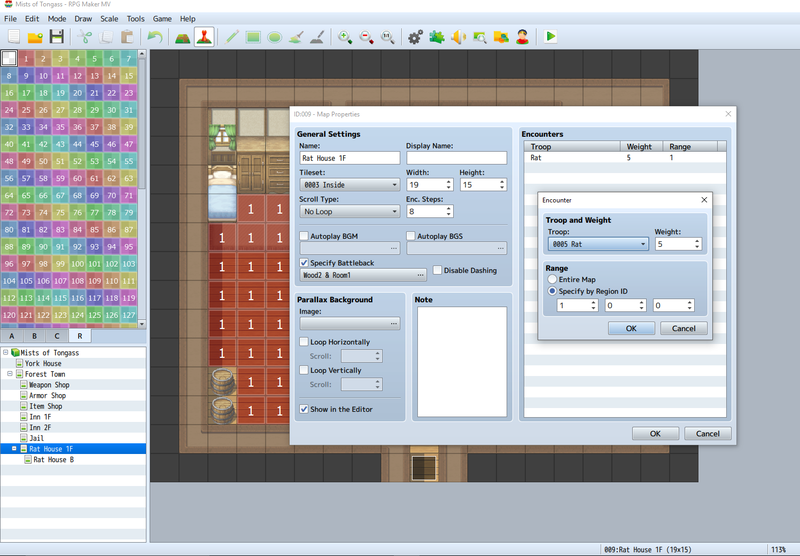 In event editing mode, return to the jail map and double click on the Constable. 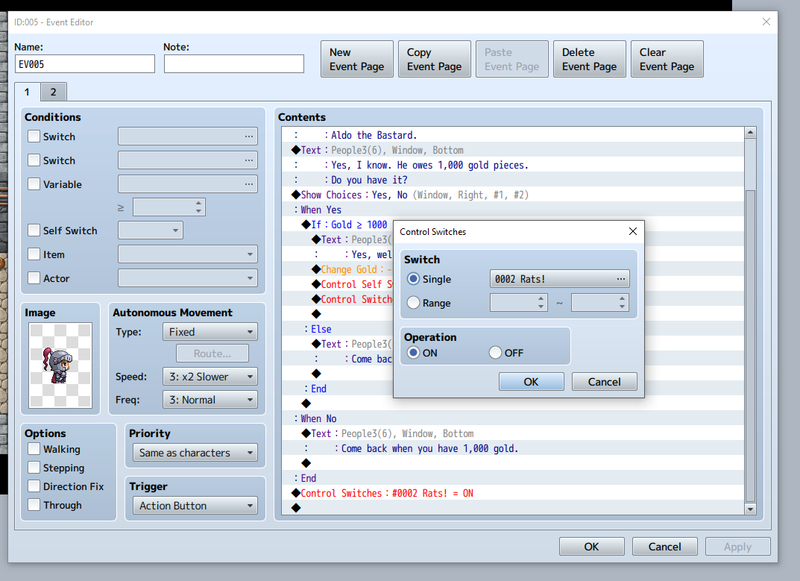 In the last line of the Contents window, beneath “: End”, double click on the empty line and select “Control Switches” from the Game Progression subheading. Add a new switch in line 0002 called “Rats!”, then click OK. Make sure the switch is set to ON, then click OK again. Click OK a third time to close out of the Constable. Now, return to the Forest Town map. Somewhere on the road outside the jail, create a new event and choose an image of a random villager–maybe the guy with the mushroom hat in People4. Under Conditions, check the box next to Switch and then select “0002 Rats!” from the dropdown. Under Autonomous Movement – Type, select “Approach” from the dropdown. You want to make this guy hard to avoid. There are a couple things we need to set up before getting to the quest. First, we need to create two things: an item and a weapon. 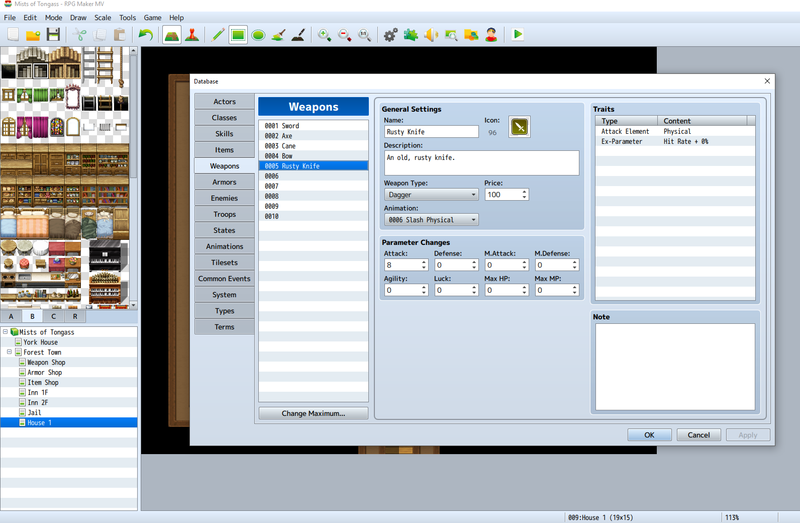 Load the Database Editor and click on the Weapons tab. Change maximum value to 10, then select blank slot 0005. Type in the name “Rusty Knife,” then select an appropriate icon. Click the dropdown under Weapon Type and select “Dagger.” Click the dropdown under Animation and select “0006 Slash Physical.” Change price to, say, 100, and Attack to 8. Then click Apply. Now click on the Items tab. In blank slot 0006, type in the name “Rat King Tail,” then select an icon (I picked something that looks like sausage links). Change Consumable to “No” (gross) and Occasion to “Never.” Leave everything else the same and click OK.
Now we need a location. 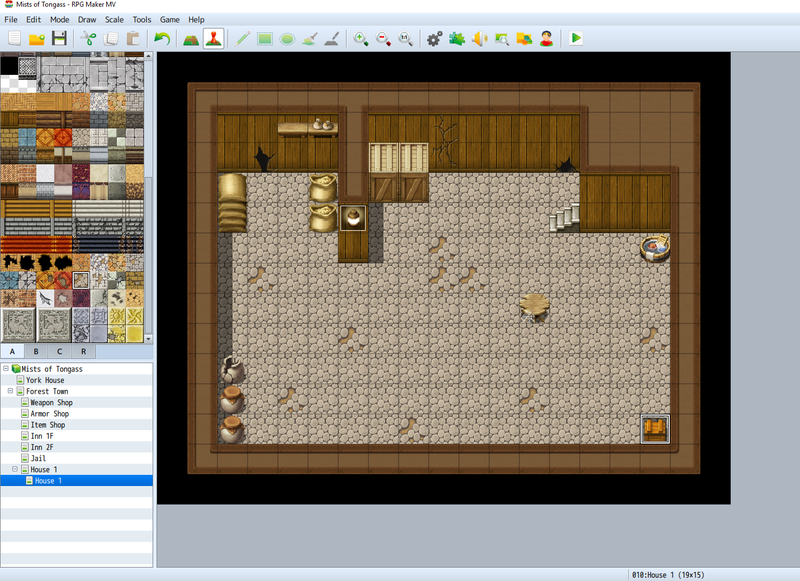 Right click on the Forest Town map and load a pre-made house interior, say, House 1. Copy and paste that map to use as a template for the basement. Replace all the furniture and the floor in the the basement with stone tiles. Finally, add some random objects to the basement. Use CTRL+3 to create a quick treasure chest containing a healing potion. Notice how you can change its image–I chose a plain-looking crate. Don’t forget to place a stairs leading up in the basement level and a stairs leading down on the main level. Use CTRL+1 to quickly create transitions on the stairs that will move the player from one level to another. Also, create a transition from the house entrance to the exterior town map. Place the exit in front of one of the two small houses southeast of the jail. We want to create random encounters in this house with enemies we created in Part V, but how? In previous installments, we learned how Tilesets A, B, and C allow us to paint different layers on the map. If you click on the fourth category, R, you see how it’s just a bunch of colorful numbered squares. These tiles allow us to create different enemy encounters in different areas of the map, if we wanted to increase the difficulty, for example. On the house’s main level, paint tile 1 (transparent red) over the entire floor. 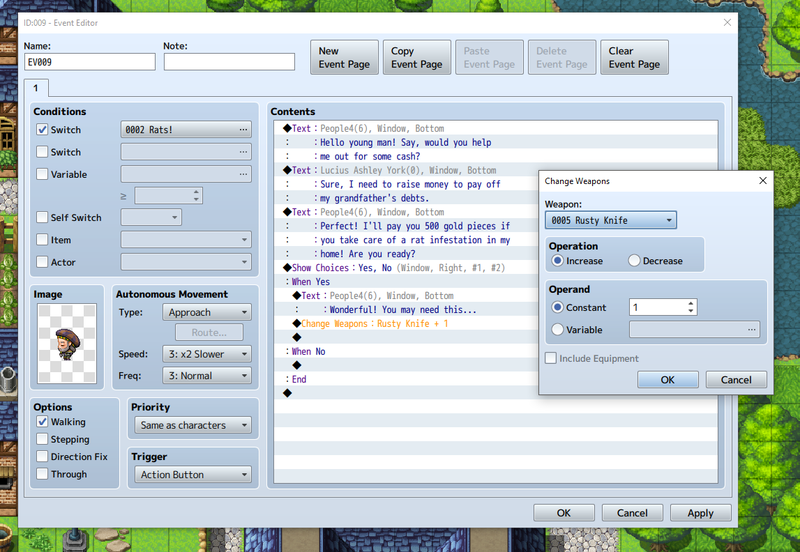 Then press the space bar to edit the map’s properties. Under Encounters, double click on a blank row and select “0005 Rat” from the drop down. Under Range, select “Specify by Region ID”, enter 1 in the first box, then click OK. Click OK again to return to the map editor. Now, every time Lucius steps on one of those squares, he has a chance of encountering a Giant Rat. Divide the basement floor into three regions: 1 (red), 2 (orange), and 3 (yellow), with 3 being farthest from the stairs. This time, add three encounters: Rat, Rat*2, and Rat King. Assign Rat to region 1, Rat*2 to region 2, and Rat King to region 3. Finally, lower the Enc. Steps in Map Properties for both maps to 8. This is the average number of steps the player will take before encountering an enemy troop. 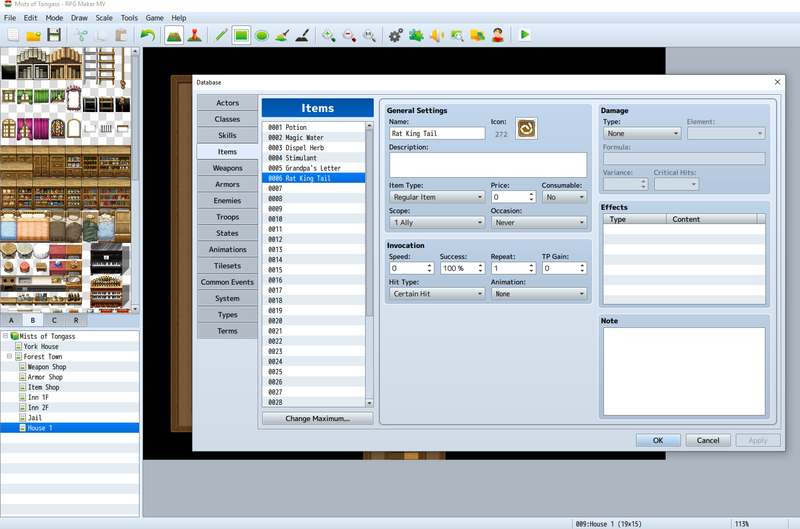 Open the Database Editor and click on the Enemies tab. Click on “0006 Rat King” and select the top slot under Drop Items. Select Item, then 0006 Rat King Tail from the dropdown. 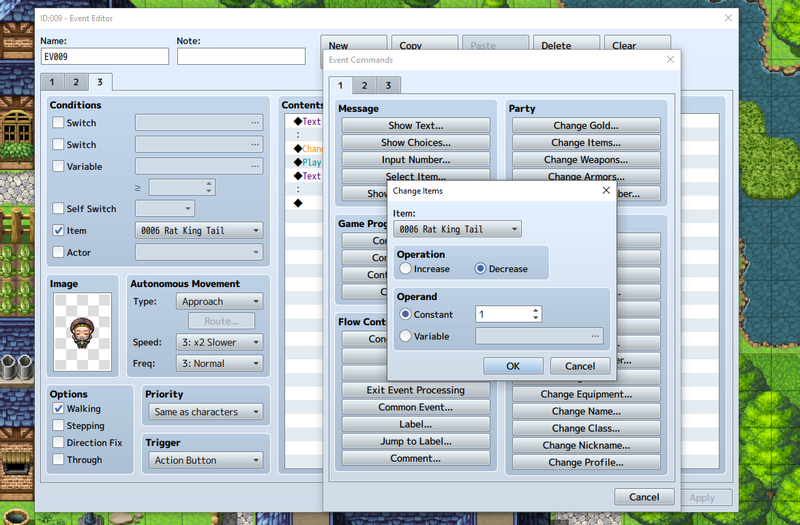 Click OK twice to close out of the Database Editor. If the player selects “yes,” the villager will give Lucius the Rusty Knife, and then Lucius will automatically be transported to the quest house’s main floor. Before Lucius leaves, have the villager tell him to bring back the tail of a Rat King as proof. In the next line, insert the command “Transfer Player” from the Movement subcategory. Choose a direct designation inside the quest house. In case the player decides to leave the house without obtaining the quest item, and to prevent him or her from getting infinite number of rusty knives, Create a new event page with the same image and movement behavior. Under Conditions, select Self Switch B. In the Contents, insert a line of dialogue saying, “Good luck!”. Then, in Pages 1 and 2, insert a command to turn on Self Switch B right after the command to Transfer Player to the house. One more thing needs to be done. In order for Lucius to be able to equip and use the knife, a Trait needs to be added to his Class (Hero). Open the Database Editor and click on the Classes tab. 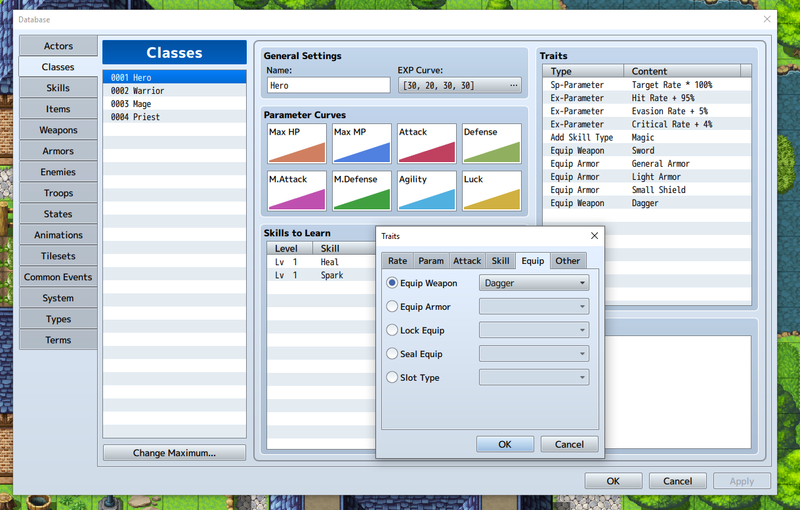 In the Traits window, double click on an empty line, select Equip, Equip Weapon, and then pick Dagger from the dropdown. Insert Change Items, 0006 Rat King Tail, and Decrease by 1 to remove it from the player’s inventory. Then, finally, turn Control Self Switch C on and create a new event page. You guessed it, check Self Switch C as its condition. Change Autonomous Movement to Random and insert a line of text thanking the player. 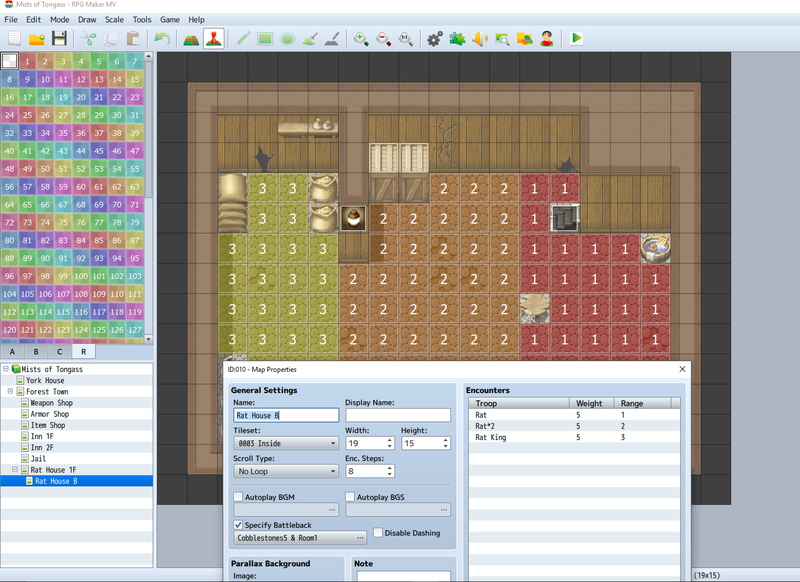 In this installment, we set up Lucius York’s first mission, created a level (house+basement), and filled it with enemy encounters. We set up conditions for completing the mission and its reward. Most importantly, we prevented any loopholes or glitches (being able to attain infinite Rusty Knives, for example). In part 6, we’ll slow things down a bit and set up stores where our hero can purchase items and equipment for future missions.